Within Pelican Bay is the exclusive residential community of Bay Colony. A grand gated community featuring some of the most luxurious residential homes in all of Pelican Bay. Where residents enjoy Naples only gated beach front and golf club community that emphasizes privacy and security. Residents of Bay Colony enjoy a world class lifestyle with memberships available in the Bay Colony Golf Club, the Pelican Isle Yacht Club and easy access to the Ritz Carlton, the Naples Philharmonic Center for the performing arts and visual arts and the waterside Shops hosting the finest in retail shopping and restaurants. The Crown Jewels of Bay Colony residential living are the 12 ocean front mansions in the gated enclave called The Strand. A privileged few own homes at The Strand and it is a rare occasion that one of the estates is available for sale. Security and privacy is at the core of this lifestyle for the discriminating homeowner. Then there are the six beautiful beach front condo towers, the only beach front high rises in Pelican Bay. They offer some of the finest quality condominium residences and pent houses on the west coast of Florida. The Biltmore, Brighton, Carlysle, Contessa, Remington and Windsor provide buyers with beautiful views of the Gulf of Mexico and two miles of white sand beachfront. Each high rise tower is unique and offers a wide variety of quality and luxury. There are also high rise towers that look over the protected Pelican Bay preserve and wildlife habitats for indigenous bids and other wildlife. The Mansion La Palma, a mid rise tower, The Marquesa, Salerno, Toscana and Trieste, the high rise towers, all feature the finest in luxury condominium living and stunning views of the Gulf of Mexico. If you prefer a single family luxury home there is the gated community within Bay Colony called The Shores. Stunning luxury custom built homes with the finest quality money can buy. Sixty Six estate homes grace the fresh water lakes, protected preserves and lush landscaping. The estate homes range in size from approximately 300o to over 10,000 square feet of custom designed and built luxury living area. There is also the beautiful Villa communities Vizcaya and Villa La Palma that offer luxury custom built homes with lake views and lush tropical landscaping. Bay Colony residents enjoy private and exclusive amenities. The Beach Club offers casual and formal dining, inside and outside bar areas, a beach front fresh water swimming pool and of course the luxury of Naples finest white sand beach and the Gulf of Mexico. The Tennis Club offers six state of the art hydro clay courts, pro shop and weekly professional lessons and special events. 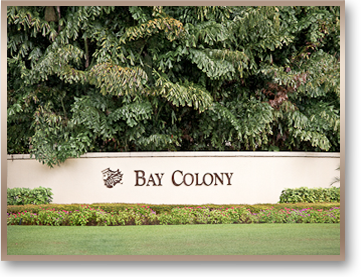 For the Avid golfer there is the Bay Colony Golf Club. Featuring a 34,500 square foot Southern Plantation style Club House that provides members with a selection of fine dining and entertainment venues. The members enjoy the exclusivity and privacy of a no tee-time champion golf course for a limited 300 members. It doesn’t get any better than Bay Colony Golf Club. 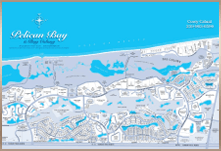 This unique and grand concept of Pelican Bay was proclaimed to be a model of environmental planning in the state of Florida and today there is no other PUD that has the natural features and planning for residential living that Pelican Bay offers. It’s one of a kind with everything that you could need within a short walk or drive from your residence. Bay Colony represents the best that real estate in Pelican Bay has to offer in residential living.